Pre-monsoon to begin in Punjab early this year! Heat to relax but humidity to take its place! Heat wave has paralysed routine life in upper Sindh. Though there is no Met office in the north region of Sindh, it is considered that the temperature is around 50°C to 51°C for the past some days. Temperatures are expected to remain above 40°C in Punjab while above 45°C in Sindh. 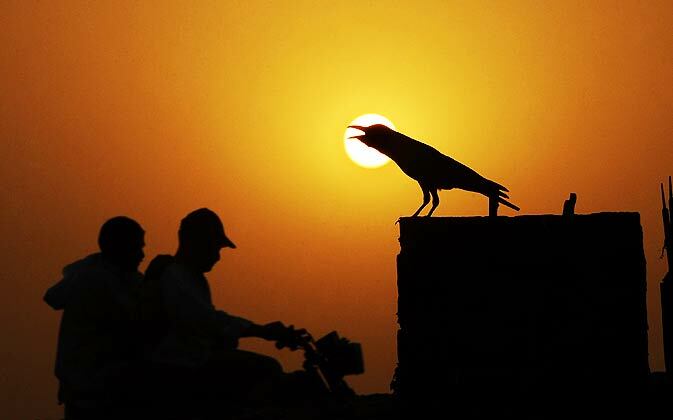 Karachi will see normal temperatures that 34 °C – 37 °C. With moisture reaching Sindh and Punjab, the humidity is likely to increase though temperatures will decrease but people might not feel much difference due to high humidity. Many people of upper Sindh have complained of irritation in eyes. People who are experiencing hot weather should wash their eyes with clean and cold water and remain under some shade or a tree during the day time. This is a seasonal virus that can be cured but precautions must be taken. Two people have also died due to this heat wave in Sindh that started from June 8 and is still on going. Weak pre-monsoon currents are reaching Punjab, parts of Khyber and Azad Kashmir from June 17 and light to moderate pre-monsoon rainfall likely in Lahore, Islamabad and other adjoining cities, these rains will not be heavy. In Karachi, the moisture accompanied by pre-monsoon activity has caused some thick clouds to over the city with fast winds (44 km/h). In coming days more “on and off”clouds are expected in the city but no rainfall likely till June 23. Over all the weather will be pleasant in Karachi with fast SW winds and clouds at night, morning and evening. It is said that Karachi has more number of days of cloudy periods in monsoon season than any other city of Pakistan but the level of precipitation is quite low when compared to other cities. 3 Pre-monsoon spells in Pakistan after that Monsoon of 2011 begins! 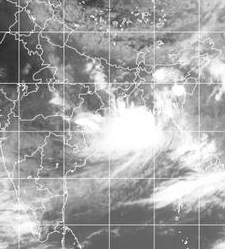 Heavy rainfall likely in central, eastern and western coast of India. A trough is increasing monsoon activity in western coast of India, while a depression has helped further advance the monsoon many parts of India. This deep depression BOB 02 is the first depression in the peninsular sea after the drought year of 2009. The year 2010 also had a normal monsoon but it was also without a depression in the Bay of Bengal, only the second such instance after year 2002 in a recorded history of 121 years of tracking monsoon depressions. Depressions in the Bay emerged only after when the monsoon was over. In short, they were late! Some light pre-monsoon rainfall in Punjab, parts of Khyber and Azad Kashmir from June 18. The intensity of these pre-monsoon rains will be weak. Moisture from Arabian sea has started reaching these regions. Second pre-monsoon activity is likely in Sindh, this could be heavy in nature as the remnants of Deep depression BOB 02 will enter Gujarat from June 21. It is still too early to go in-depth of this pre-monsoon rain. The third and last pre-monsoon rainfall expected in last week of June. After these pre-rainfall, the monsoon of 2011 will begin. If the readers want to know the previous pre-monsoon and monsoon dates of 2010 and 2009 of Pakistan then check this. This year pre-monsoon activity in Punjab has started early than Sindh as compared to 2009 and 2010. It is also worth mentioning that 3 pre-monsoon spells this year are quite to many for Pakistan that too in June, mostly there is only one such activity that occurs late in June. ← Lunar eclipse – Watch out Pakistan! yahoo, cnn and accuweather predicting a thunderstorm on friday june 24 babar bhai wats ur take on that????????? clouds coming and going in karachi nights are cloudy for few hours but day is as usual sunny to partly cloudy why can we see cloudy and overcast conditions in karachi?? There are few chances that the remnants of DD BOB 01 MAY cause some pre-monsoon rains in Karachi (But it is not confirmed yet)…the cloudy activity occurs every year from June till August and some times first week of September especially in Karachi…. Aap punjab walo ko to winter mein hi itni rain mil jati aur monsoon mein bhe phir bhe app log khush nahi hotay. you are very anxious about our rain too besides other things. why don’t you wash your minds against the Punjab? Dear Babar, You always say that rain is expected over punjab and nwfp and kashmir etc. Will you ever say with confidence that karachi will also have rains? What is our sin? Karachi aur sindh ka to allah hi hafiz hai. Jab dekho punjab,nwfp aur kashmir mein barish ka boltay hai. Kabhe Na kabhe to allah karachi mein bhe rain dayga aur forecaster to karachi mein kabhe nahi batanay walay barish ka. This thing is unable to understand that pakistan and India are wet but Greater karachi is dry and hot. mostly punjab effected by western distrubances, is low pressure reaching to sindh during next few days? weather will remain cloudy next frday in karachi. few chances of showers in karachi. Monsoon boy thanx 4 giving us gud news.bt problem is that babar bai is silent ??????? Well..the reason i am silent is that there is no new weather update for Karachi…there is a lot of moisture in Karachi due to monsoon winds…the city needs a weather system near it for rainfall now…chances of rains from June 22..
INSHA ALLAH karachi will get good rains this monsoon just be hopeful this happens almost every year but then we see heavy heavy downpours lashing karachi. tonight or tomorrow rain may occur in capital again…But rain has occurred in Islamabad…59 mm rainfall is recorded this morning.. Consensus view is now veering round to the possibility of the gradually weakening system sparing Mumbai its direct fury (but not all the rains) and wheeling into southwest Rajasthan and across the border into Pakistan. This would pan out over the next three to four days. Meanwhile, the Taiwan Central Weather Bureau, which correctly predicted the Arabian Sea and Bay of Bengal storms, has hinted that the Orissa/West Bengal coast might another low-pressure area over the next 8 to 10 days. Yaar jisko dekho to PUNJAB, NWFP AND KASHMIR ki predict karta rehta hai rain !! HAMARI SINDH NEI AAKHIR kiya kasoor keeya hai jo itni garmi hai yahan pe and rain ka koi pataa ya dekhaai hee nai !!! khaali clouds bi nai arahey hei yahan LARKANA mei please tell me LARKANA and SINDH mei rain system kab start hoga is saal ? can you please tell me that BOB 02 is what is ? and it could be enter in sindh ? its remnants might (50 50 chance) cause strong rain in Badin, Mirpur khas, Keti, Shah Bander, Umer Kot, Karachi and other adjoining cities…while light showers in other parts of Sindh including Larkana….but this storm could also fizzle out over India before reaching Pakistan..
so wat does this humidity and unusual cloudy weather mean? BABAR BAI thanx alot 4 givings us in4mation, babar bai chances of rain in karachi r increasing or decreasing due 2 deep depression????? yaro ho jain gi barishain,bas sab mil ker duain karain. inshallah july se phely app 1 achi barish dekho gay karachi main. in which area you live??? Because they are too small to be seen from satellite and these clouds are no rain clouds….neither any part of any weather system..
Babar bai there r some clouds rite now over karachi.is this a sing of rain??????? in live in chapal sun city near kiran h0spital, saeurah, karachi. Tell exactly about Rain in Hyderabad And Karachi.. Which system will effect Sindh..
And Will BOB 2 will effect Sindh Or Not ?? PWP had forecasted that monsoon will start in Karachi after July 15…. https://karachimetrological.wordpress.com/2011/05/16/when-will-monsoon-start-over-pakistan-in-detail/ .. When will u post ur new article regarding monsoon update ? Can I hav ur Mob numb bro ? dont expect any major falls before mid july , as for the clearing part for the coming monsoon season this year in sindh. bbc again right.no rain near sindh also. i think fresh low pressure will give rain to sindh from 1 july lets see forward bbc forcast. as i said bbc forcast is best.again no rain near sindh also.i think new low pressure of bay of bengal is for sindh lets see and watch bbc forcast. Salam to allz my friends and i want to ask that still there is no Rain in Interior Sindh Or In Larkana City Please tell me why why pehly to esaa nai hota tha June Start hotey hee baarishein hojati thi start but is baar kiya problem hai weather mei ? JAB Dekho to Punjab Kashmir mei barishein bata rahein hein SINDH BALOUCHISTAN mei baarish hee nai hai why ?